Over the years, many classic articles on behavior and energy have been published, and we here at the Behavior Program have been reviewing and discussing them with an eye towards moving the conversation forward. Our goal for the program is to take such academic insights, and turn them into robust, testable hypotheses, with the ultimate aim being to move them closer to actionable product or program concepts. In order to avoid reinventing the wheel, my colleague Ben Foster and I have been raiding the ACEEE archives to see what might have stood the test of time, and what might require rethinking in light of new technological developments (such as the introduction of front-loading high-efficiency washers and dryers). As an anthropologist, my eye was immediately caught by some of the work done by Rich Ling and Harold Wilhite for the Summer Study meetings back in the early 1990s. One in particular from 1991, “The Ethnographic Examination of the Role of Energy Efficiency,” seemed ripe for review. The authors’ basic finding is that, despite the fact that there were HUGE disparities in terms of the energy efficiencies of various domestic appliance models, the concept of energy efficiency did not have a role in the sales pitches made in retail showrooms. The average models used 150% to 300% more energy than the most efficient models. So Ling and Wilhite conducted an ethnographic analysis of the context in which sales were made — they talked with salespeople and customers, read manufacturing literature, and watched transactions in Denmark, Norway, and Finland. The basic script concerning energy efficiency at that time seems to have been: “customers are not interested in it, it is a technical detail, and they can read the literature if they so desire.” Now, given that twenty years had passed, and this was Scandinavia (well-known for its liberal “brand”), one might assume that things have changed. One would assume that wrongly. It happens that I read just enough Danish to be able to peruse some ads for the high end German appliance firm Miele, in which nary a mention of energy efficiency resides. Instead, the ads tout one’s “good taste” in choosing their espresso machine, the “best treatment” afforded by their washers, and the “flexible assistance” offered to one’s “busy lifestyle” by their dishwashers. Concepts referenced also included “convenience” and “customization”and “lovely” showrooms. Ling’s and Wilhite’s insights are holding up twenty years down the road. “Ok,” I asked myself, “perhaps this is a very Danish kind of thing, and maybe they use another kind of language in the United States?” So I checked out Miele ads in the U.S., as well as LG ads, and finally Sub-Zero (more on those in a minute). In none of the Miele advertising was energy efficiency mentioned at all. This was in contrast to the LG ads, where for washers energy efficiency was positioned on the Web site as the number one selling point. GE displays energy efficiency at the top of its corporate appliances page — and on about half of the individual appliance pages, energy efficiency is the first feature listed on the navigation pane. 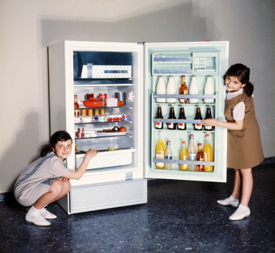 On the refrigerators page, for example, there is a large call-out for “most energy efficient refrigerators.” GE also has a series of pages dedicated to the appliances that have gained the ENERGY STAR label. Whirlpool: Efficiency is muted. The front page emphasizes capacity of refrigerators, with no particular call-outs for efficiency. The focus is on design, space, flexibility, and ease of use. Water heaters get a call-out for "saving money and energy," but reliability is emphasized. However, "high-efficiency" washers are specifically promoted. Back to LG and Sub Zero — For refrigerators, things got more complicated, with the lower priced LG refrigerators using energy efficiency as one of four equally weighted bullet points; but as one moved into the higher-end models, this mention shrank to the mere use of the ENERGY STAR logo. The extremely high end Sub Zero did include efficiency in a second tier page touting their green/sustainability credentials overall, but many of the most hulking models were intended for high octane performance, as opposed to economical energy management. Clearly, there is some sense that only “value-seeking” customers are truly interested in energy efficiency and savings, a sense that is likely misguided, since even the wealthy watch their money! Although a few manufacturers promote the energy efficiency of select appliances, Ling’s and Wilhite’s findings still stand, and they also act as a reminder to not mistake the sizzle for the steak. European countries in general and Scandinavian countries specifically have a lot of green/sustainable credibility, but this masks the fact that Danes eat, per capita, more meat than anyone else in the world. Or that Swedish cars put out the most emissions in Europe (and that European cars got 62 pounds heavier in 2010 than in the previous year). The lack of an international equivalent to ENERGY STAR means that we have not made as much progress as Ling and Wilhite might have liked to see.